Pertussis, or widely known in communities as whooping cough, is a very contagious and transmissible disease that impacts millions around the globe each year. 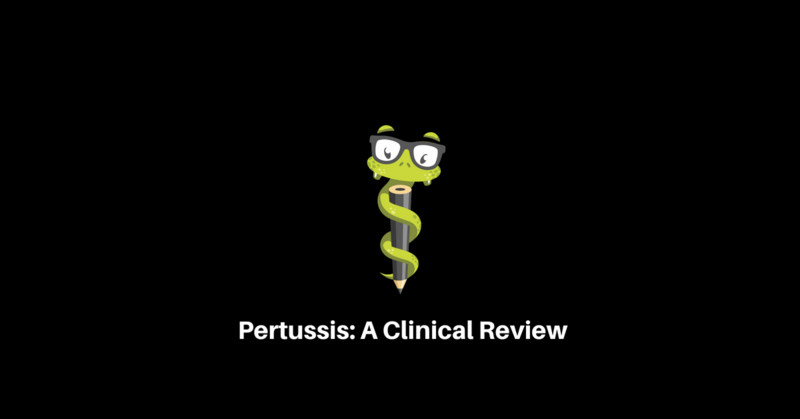 There are many pearls associated with whooping cough that may be tested on end of rotation exams or encountered via questions on family medicine or pediatric rotations. Whooping cough is very contagious, with humans acting as the host. There is no particular age discrimination, but the very young tend to have more severe disease and are at risk for hospitalization. Epidemic outbreaks have been documented across the United States, including one in my first year of practice as a family medicine physician assistant. Transmission is via aerosolized respiratory droplets in close quarters (Cataletto and McCormick, 2016). The bacteria Bordatella pertussis is responsible for transmission of the disease. Students should know that cold. World wide, there are estimated to be 48 million cases of whooping cough each year. Risk factors for transmission include recent exposure to someone with the disease, lack of immunization, waning immunization, pregnancy, chronic lung disease, immunodeficiency. One of the main measures for prevention is via vaccination. The Tdap contains acellular pertussis, which helps prevent outbreaks of the disease. One of the challenges is that there has been movement in certain areas of the country against vaccination. Another challenge is that the vaccine is effective, but does not confer lifelong immunity, as immune status can wane. The CDC recommends a Tdap at age 11-12 for adolescents, and a dose of a Tdap for all adults greater than 18 years of age. The hope is to improve herd immunity. Additionally, new recommendations suggest that a Tdap be given with each pregnancy, regardless of previous vaccination history, preferably after 20 weeks of age. In the history and physical of patients with whooping cough, history may confer a recent outbreak or exposure. Patients will classically have an incubation period of about 7 to 10 days, but may show symptoms anywhere between 5 and 21 days. The classic history is a patient with a paroxysmal cough with post-tussive whooping and potentially post-tussive emesis. Unfortunately, infants may present in respiratory distress or failure. Colloquially, whooping cough has been termed as the “100 day cough” due to its’ long lasting course. In the catarrhal phase, patients may present with rhinorrhea, mild cough, and low grade fever. This early stage can easily be mistaken for a viral upper respiratory infection. In the paroxysmal phase, the cough becomes more classic, with the classic cough, inspiratory whooping, and possibly post-tussive emesis. This phase can last weeks to months. In the convalescent phase, coughing will decrease in both severity as well as frequency. In outbreaks, adequate diagnosis is imperative to both treatment, prevention of disease, and tracking for the CDC. The best single test is the nasopharynx culture, which is 100% specific. This is accomplished via the nasopharyngeal swab. Another valuable test is the PCR, which is used due to a quick turnaround and high sensitivity. In terms of treatment for pertussis, many measures are related to preventing the spread of disease. Patients with coughing during outbreaks must wear masks. The disease itself may be less severe if antibiotics are given prior to the catarrhal phase. In patients with symptoms or cough, the use of antibiotics for close contacts can decrease transmissibility. Once cough begins, unfortunately the disease will not be slowed by antibiotics, but will prevent further spread. The CDC has put together an excellent set of guidelines and algorithms for the use of treatment decision tools and antibiotics during acute epidemics or outbreaks. The first line treatment for prevention and treatment is the same, with either azithromycin, erythromycin, clarithromycin used. For patients with macrolide allergies, TMP-SMX is useful, but should not be used in infants less than 2 months of age. Patients who are hospitalized for whooping cough should be on respiratory precaution to prevent spread. In outbreaks, there can be many questions about chemoprophylaxis for individuals. As discussed above, the CDC has a great deal of literature to help clinicians manage the disease and prevent spread. The prognosis for patients is good, but the highest risk are for patients who are neonates and infants. Overall, the disease has a lot of pearls that are commonly encountered on testing, so students should feel comfortable with diagnosis, clinical features, and treatment. Catalettto, M. and McCormick M.J. (2016). Pertussis. The 5 Minute Clinical Consult. Wolters Kluwer.